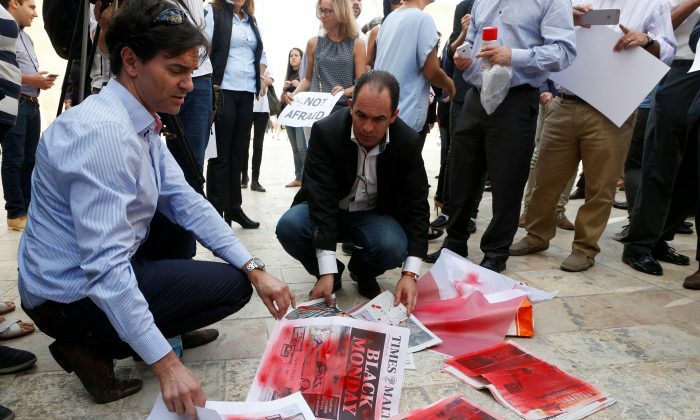 VALLETTA—Police believe a bomb that killed a prominent journalist in Malta was attached beneath her car and triggered remotely, a government spokeswoman said on Thursday, giving the first details of the investigation. Daphne Caruana Galizia, a renowned blogger and fierce critic of the government, died on Oct. 16 in a blast that wrecked her car as she was leaving her house, throwing debris and body parts into a nearby field. The murder shocked the Mediterranean island, the smallest nation in the European Union, and Prime Minister Joseph Muscat on Oct. 18 promised a reward to anyone who came forward with information about the killing. However, Caruana Galizia’s three grown-up sons dismissed the offer and called instead for Muscat to resign, saying he should take political responsibility for the first such murder of a journalist in Malta since the island won independence in 1964. Muscat has ruled out quitting and flew to Brussels on Oct. 19 for an EU summit, where his spokeswoman said investigators were making some progress. “Emerging evidences make us think that the bomb was placed under the car and was set off with a remote trigger,” she said, adding that foreign experts would be called on to help identify the mobile phone which was used to detonate the bomb. In a news conference in Valletta, police commissioner Lawrence Cutajar denied British police would join Dutch forensic experts and a team from the U.S. Federal Bureau of Investigation (FBI) in helping with the case. Muscat’s spokeswoman earlier said British officers would be involved. Cutajar said no arrests had made so far and added it was too soon to discuss possible motives, telling reporters it would take weeks to collect all the evidence. He also could not confirm reports from a Maltese police source that Semtex explosives were believed to have been used in the killing. “The police may or may not find out who ordered the assassination of our mother but as long as those who led the country to this point remain in place, none of it will matter,” her three sons, Matthew, Andrew and Paul, wrote on Facebook. As he arrived at the EU summit in Brussels, Muscat denied that he had created a “mafia state” in Malta, which is home to a large financial services sector and the continental hub for the flourishing online gaming industry. The European Parliament said it would hold a debate next week on the protection of journalists and media freedom in Malta, where the government enjoys sweeping powers over the judiciary and the police. “Malta is a Mecca for money launderers and tax avoiders,” Greens EU legislator Sven Giegold said. The prime minister says the financial services sector is as transparent and compliant as in any other European jurisdiction.